We present an unbiased standard cynomolgus macaque monkey magnetic resonance imaging template brain volume that offers a common stereotaxic reference frame to localize anatomical and functional information in an organized and reliable way for comparison across individual cynomolgus monkeys and studies. We have used MRI volumes from a group of 18 normal adult cynomulgus monkeys (Macaca fascicularis) to create the individual atlas. Thus, the atlas does not rely on the anatomy of a single subject, but instead depends on nonlinear normalization of numerous cynomolgus monkey brains mapped to an average template image that is faithful to the location of anatomical structures. Tools for registering a native MRI to the cynomolgus macaque atlas can be found in the Software section. To view the MNI cynomolgus macaque atlas online: click here. To view the MNI cynomolgus macaque and the Paxinos labels together: click here. To view the MNI cynomolgus macaque along with the Paxinos labels and a sample native cynomolgus: click here. 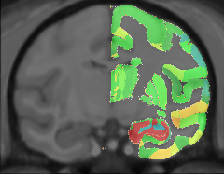 The MNI MRI cynomolgus stereotaxic coordinates (X,Y,Z) are displayed in the first row below the volumes. The second row is reserved for display of the native cynomolgus coordinates (Xnat,Ynat,Znat), and the third row for displaying the Paxinos atlas coordinates (Breg,Lat,Sup). The cynomolgus macaque average atlas is comprised of 18 T1-weighted MRIs of normal young adult cynomolgus macaque brains. This atlas is not based on a single subject but instead is an average constructed from the averaged position, orientation and scale from all the individual subjects and is representative of both the intensities and spatial positioning of anatomical structures. The rhesus atlas was created via the macaque atlas (see Macaque for details). By averaging the voxel intensities of the 7 rhesus MRI which were resampled in MNI macaque space, a mean intensity image is created. The deformations for these 7 animals were also averaged together, inverted, and then applied to the mean intensity image to create the unbiased standard rhesus macaque monkey MRI template brain atlas.